Colony Heating and Air Conditioning > Blog > Blog > IS YOUR FURNACE SHORT CYCLING? What does “Furnace short cycling” mean? It’s an HVAC term used to describe when heating and cooling equipment frequently cycles on and off independent of the thermostat set point. Generally this happens because the Furnace is internally getting hotter that what it is designed for. This is a safety feature of all gas Furnaces, one to protect the Furnace from overheating and two, to avoid a potential fire in the home from excessive heat. A cycle refers to the length of time the system is either heating or cooling. You may hear the Furnace turn on and then turn off before your home is at your desired temperature. Let’s explore some reasoning behind this. Two very common reasons for a Furnace short cycling are generally easy fixes. Please check your air filters often. A dirty Air Filter restricts air from reaching your Heat Exchanger. The unit will then overheat and the “limit switch” will disable the unit. Depending on which kind of Furnace you have, it will either exhaust through the roof or out of the side of the home. Snow drifts and ice buildup caused by condensation and low temperatures are major culprits for short cycles. Check out these articles on Dirty Air Filters & Blocked Exhaust Vents. Other reasons for Short Cycles include; Plugged Drain Vents, Thermostat location (near lamp, window, etc. ), Cold air from behind the Thermostat, or the Heat cycle rate set on back of the thermostat. Another common issue is a dirty flame sensor. The flame sensor is a key component to the functionality of the Furnace. It informs the Furnace if there is a flame while the gas valve is open. The sensor shuts off the gas valve if it doesn’t detect a flame preventing gas from entering your home. Corrosion sometimes occurs on the flame sensor, preventing it from sensing the flame. When it thinks there is no flame, it will close the gas valve thus shutting down your system. 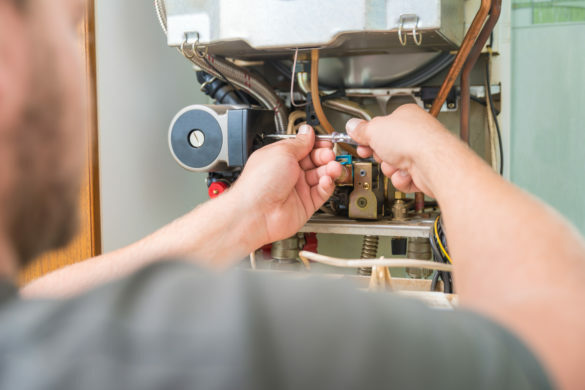 Annual Maintenance from Colony Plumbing, Heating and Air Conditioning helps prevent a dirty flame sensor and keeps your Furnace running when you need it most! Your HVAC system is one of the biggest investments you’ll make in your home. If you need a new system, a Professional from Colony will stop out and make sure your previous system was sized correctly, and bid the perfect size system for your home. Bigger is not always better. For example, a Furnace that is too big for the home will heat the home too quickly. It will reach the set temperature and shut off. When your home cools, the Furnace will kick back on and repeat the cycle. Starting up and stopping continuously is hard on your system. This will age your Furnace prematurely and may require early replacement or costly parts. If you happen to experience short cycling, “Call the Guys you can Trust,” at Colony Plumbing, Heating and Air Conditioning! If you’re located in the Cedar Rapids & Iowa City corridor, we would be happy to assist you. We encourage you to take part of our Annual Service Maintenance Agreement in Commercial or Residential applications. Call us Today for service, 364-HEAT (4328).